This summer, my Yosemite backpacking trip turned into a California road trip after a forest fire ended the backpacking trip before it even started. Thankfully my good friend and I had a smart phone and a car so we could continue our week-long expedition. Our first stop after Yosemite National Park was the Redwood National and State Parks. 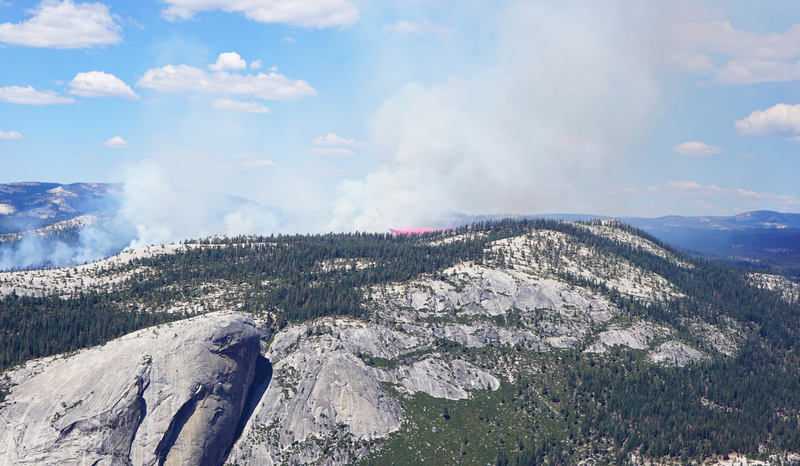 A converted DC-10 drops a red chemical onto the forest fire in Yosemite. 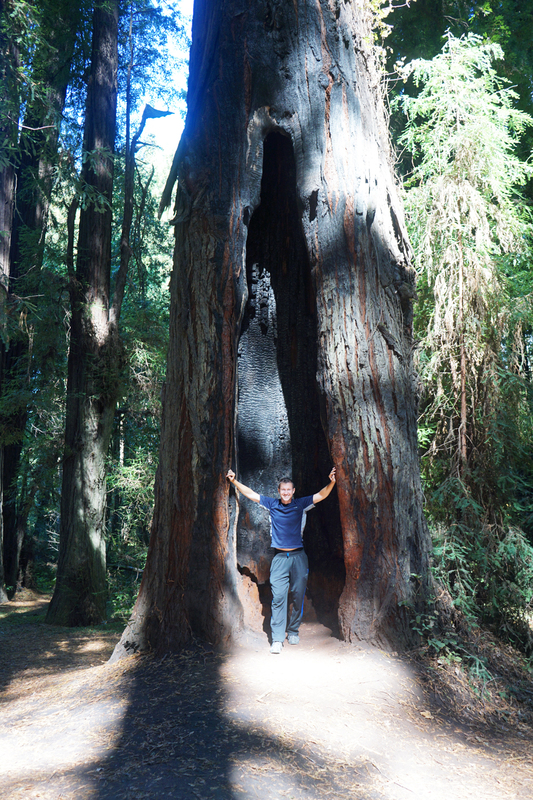 This was my first trip to California and also the Redwood National and State Parks so I didn’t know what to expect. I anticipated driving to the edge of a very large forest and then hiking a significant distance to the middle of an old grove of trees to observe the last remaining redwoods. If this is what you are expecting, you’ll definitely be impressed. 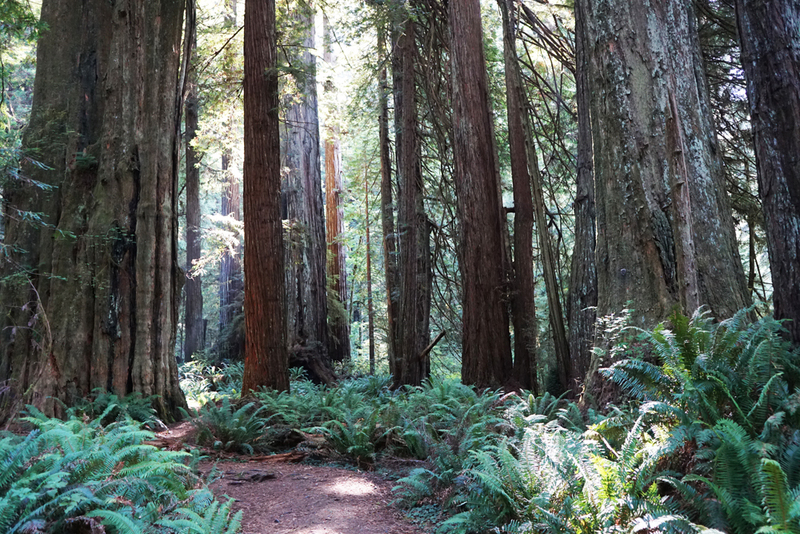 The Redwood National and State Parks are even larger than the name suggests. 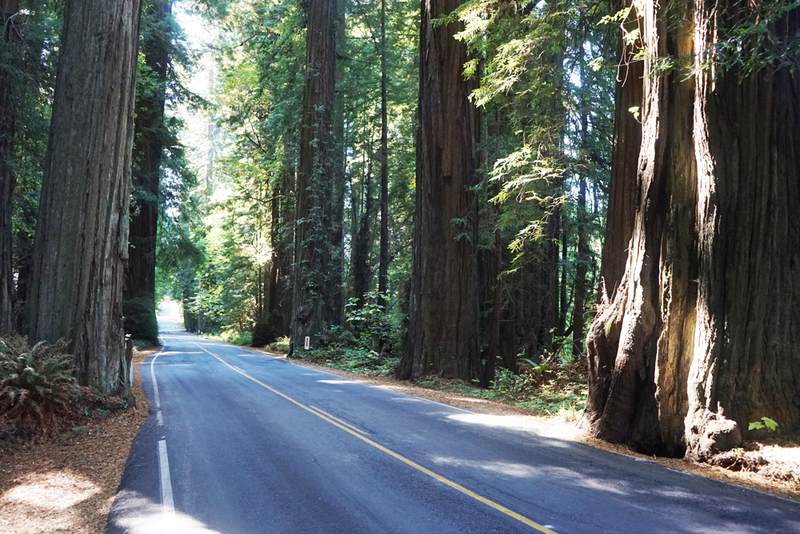 You can drive over an hour through redwood groves without even getting out of your car. The trees themselves are huge and you can drive (for a fee) through some. My friend and I drove along the Avenue of the Giants which offered amazing views of the redwoods. This road mainly ran along the expressway but it went through huge tree groves with a much slower speed limit. Given that our rental car struggled throughout the trip, I’m sure it appreciated the 35 mph speed limit. The views along the Avenue of the Giants was amazing! Huge trees bordered each side of the road. The entire road, which we drove for over an hour, resembled the above picture. The trees themselves were huge. I’m standing in the cavity of a tree that appears to have burned because it was struck by lightening and caught fire. In the Redwood National and State Parks, you’ll notice that many of the tallest trees have caught fire and either burned out the core of the tree (as pictured above) or burned off the needles/leaves at the top of the tree. I imagine this is because the lightening strikes the tallest trees first. There were a number of areas where you could pull off the road to take a mini hike into the redwood groves. In addition to the huge trees, there were a number of other nature things to see. 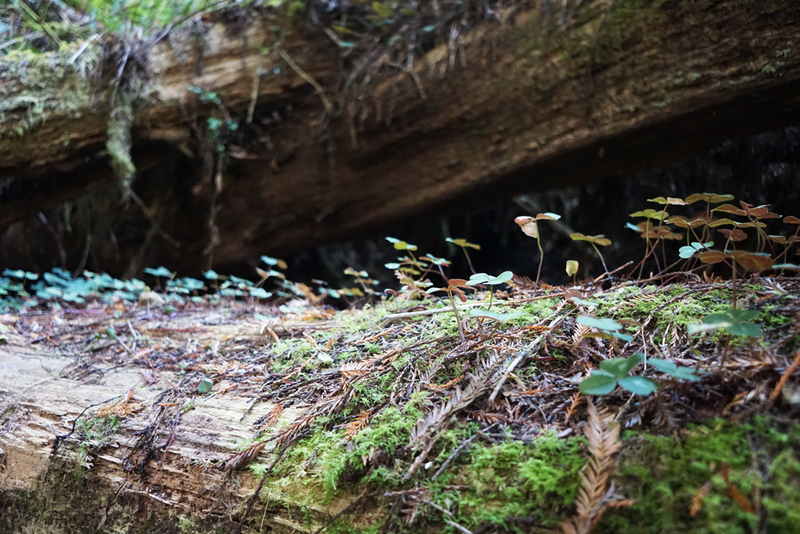 The next photo shows some sort of clovers growing on the top of a downed tree because the falling debris started to decompose. We saw what I believe is an elk (thankfully from the car) in Patrick’s Point State Park. 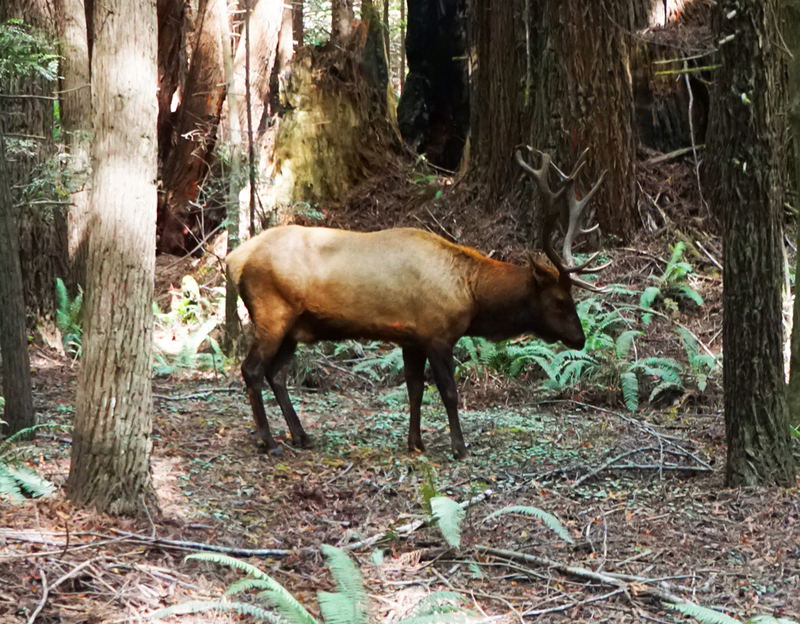 The state parks were marked with signs that warned about approaching wild elk. Given the size of this elk’s antlers, we did not need to be warned. The Avenue of the Giants offered several side attractions. 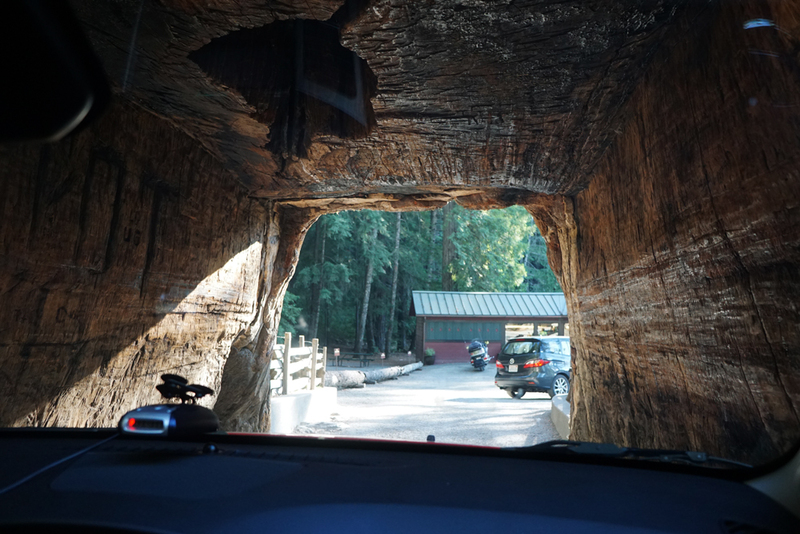 One of the coolest parts of our trip involved driving through a redwood. We drove through two (one is pictured above and the other is pictured below) redwoods. These trees were not part of the park and appeared to be in a person’s backyard. We paid about $5 per tree to drive through them and we discovered them by following the signs on the Avenue of the Giants. It was a tight fit and definitely got our adrenaline pumping. This hole was apparently formed when the tree started tipping and dropped a branch to correct itself. According to the plaque at the base of the tree, these tall trees have shallow roots and balance themselves by growing branches on the lighter side of the tree. Amazing. This view is from inside the tree. You’ll notice the gift/ snack shop right after you exit the tree. There were fairly common and, again, were placed in a person’s backyard. The Redwood National and State Parks are definitely worth a visit and can be appreciated both by folks who want to drive through and by folks who want to hike. Additional resources: scenic drives, hiking trail maps, ranger programs, and camping options. 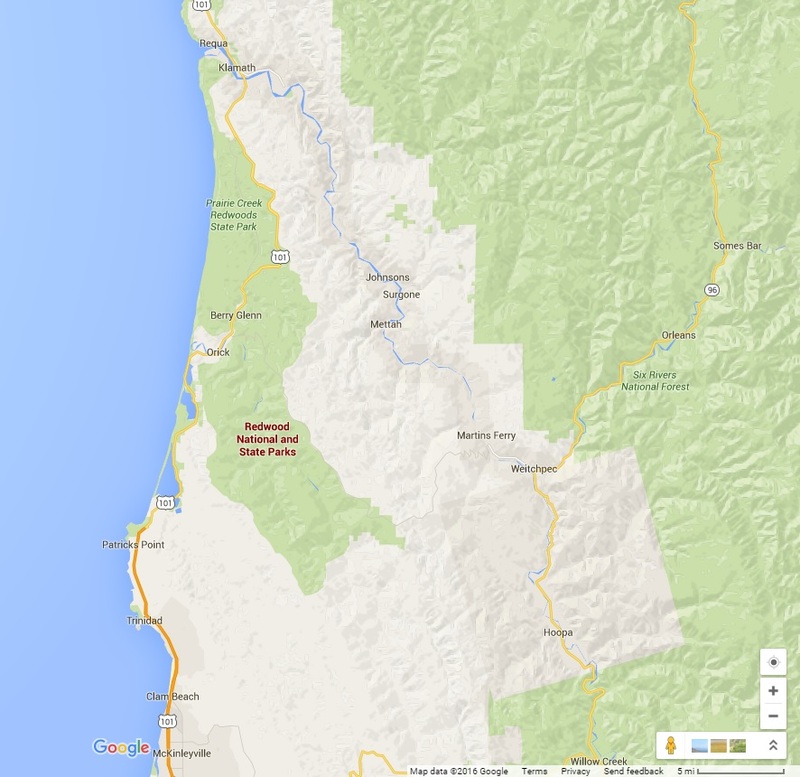 2 Comments on "Redwood National and State Parks — Road Trip!!" 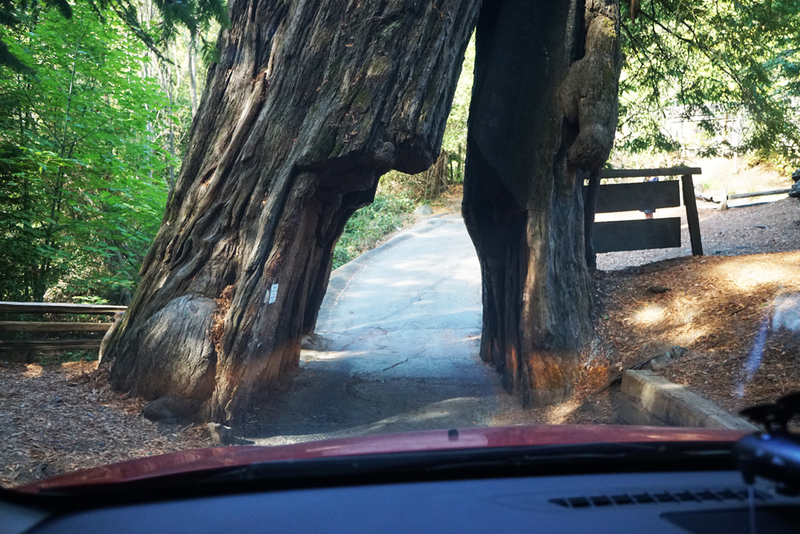 That must have been pretty cool driving through those trees. It looks beautiful there so it sounds like it was a great road trip. It was amazing. Not quite Yosemite beautiful, but it was charming in it’s own way. You definitely don’t want to veer off the road.